The hotel entry was unique. Shopping was good. Buffet was expensive and terrible. Food was very bland. Room was not good. Very dated, Musty, Molded smell. Would not recommend staying there. The cleanliness of the guest rooms were horrible. Other then that it was an ok property. 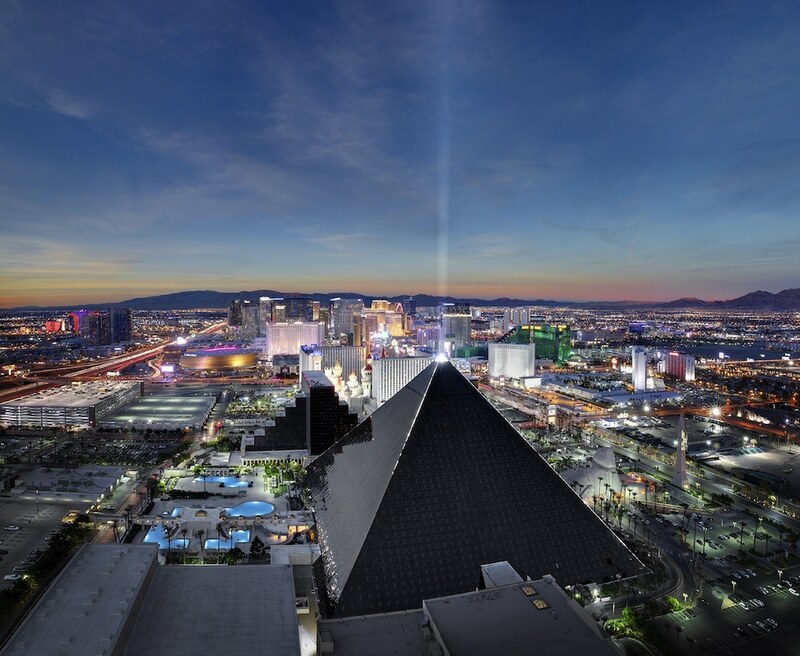 This property built as a pyramid has a huge inner space for which different levels of entertainment can be seen including a casino floor. Upper levels have restaurants and various entertainment and shopping areas. All seen by the walkway outside your hotel room front door as your room lines the inner wall of the pyramid with slanted window included. Be prepared for the best elevator ride this side of Willie Wonka's chocolate factory experience. I have spent nearly 50 years in the Las Vegas area as it is native to me and I have staycationed on nearly every property here. Other place may be more glitzy, but no none other than the LUXOR for the most unique built hotel here. I marveled at it with every step. The checkin was great. Staff was very friendly and helpful, willing to answer all questions. Decent for an older hotel. Didn’t like the hidden fees. Present lol fees up front. No complimentary items such as coffee in rooms. Calling helpdesk requires long time and often no response. Good location, nice staff. Nice surprise that parking is free at all its sister properties as well. I would recommend this hotel to gamblers and families as well. The room was clean and lovely. I liked that the hotel was easier to navigate than some of the others on the strip. The pool was nice as well but there weren’t enough chairs for everyone! But other than that we had an amazing time and will def be back soon! Your gracious review is deeply encouraging. Join us next time at Public House. Public House serves tasty American and stadium favorites like the enormous Big Boy Burger served on a pallet, house made sidewinder fries and over-the-top milkshakes. Come in to watch your favorite football team on our two jumbo screens! We look forward to your next visit! Your business and feedback are very much appreciated, and we would love to have you back to provide a 5 star experience. When your travels bring you back to Las Vegas, join us at Tender Steakhouse. TENDER offers one of the most impressive selections of dry- and wet-aged steaks you'll ever experience. We hope to serve you again soon. Thank you for your encouraging review of Luxor Hotel & Casino. We are pleased to see your stay received a high score of approval! Your patronage is deeply appreciated. We hope to see you again soon. The resort has 4 outdoor swimming pools and a seasonal outdoor pool. A sauna and a fitness center are other recreation options. Guests under 18 years old are not allowed in the fitness facility.